Cyril, aware that this was a challenge to the heart of our faith, demanded that an ecumenical council be called to settle the matter. So in 431, the Council of Ephesus met, under Cyril’s leadership, and solemnly proclaimed that Mary is indeed rightly to be honored as the Theotokos, the Mother of God. It proclaimed that from the moment of his conception, God truly became man. Of course Mary is a creature and could never be the origin of the eternal Trinity, God without beginning or end. But the second person of the blessed Trinity chose to truly become man. He did not just come and borrow a human body and drive it around for a while, ascend back to heaven, and discard it like an old car. No, at the moment of his conception in the womb of Mary, an amazing thing happened. God the Son united himself with a human nature forever. Humanity and divinity were so closely bound together in Jesus, son of Mary, that they could never be separated again. Everything that would be done by the son of Mary would be the act both of God and of man. So indeed it would be right to say that a man raised Lazarus from the dead and commanded the wind and waves, that God was born that first Christmas day and that, on Good Friday, God died. This is another great article by Dr D’Ambrosio. We are fortunate to have in CL thoughtful and challenging articles by committed and knowledgeable Catholics such as Dr D’Ambrosio. But are titles “Mother of God” and “God Bearer” synonymous? Now with surrogate motherhood distinctions can be made. As the bearer and the mother can be different. Even though the Holy Spirit was the sperm donor, Mary is the genetic mother. In the image with this post we see “MP QU”, an abbreviation of MHTHR TOU QEOU (????? ??? ????) 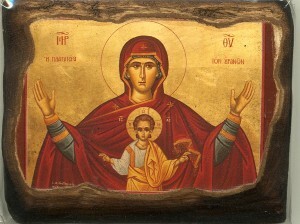 which is not Theotokos (????????). However a million years ago in primary school I learned that Mary is the Mother of God, because Jesus Christ her son is God. Jesus did not have a split personality, but he is split by nature having two, one human and one divine. Finally the idea that “God is dead” is usually associated with Nietzche. Did God die on the cross? The word God means: a powerful being. Moses was one: Exodus 7:1 and the judges in Israel were gods Psalm 82. Our Lord and Saviour was a powerful being but not God himself. Agape, thank you for your thoughts. The view you espouse has been examined and rejected by the Catholic Church in antiquity. 1. The Son is not created; He is generated. 2. His nature as God is eternal and unchanging; He assumed human nature to Himself in the Incarnation. 4. It is not possible for divine nature in its essence to be given to one who is not divine because it is an attribute of divine nature to be eternal and unchanging. Therefor if you consider the Son to be divine ever, you must consider Him to be divine eternally. 5. Agape, please tell us what you understand of the doctrine of the Holy Trinity. I know you do not BELIEVE it, but I want to know if you understand it. I think a better case could be made for adoption, not at Christ’s baptism but, at the resurrection, since St Paul wrote “and was declared to be Son of God with power according to the spirit of holiness by resurrection from the dead, Jesus Christ our Lord “(NRSV, Rom 1:4). Mary is, as usual, very sound and clearly shows Catholic teaching, even if she makes Jesus seem like electricity, being generated. I prefer the new/old formula which we now say, after a lapse of about 50 years, at Mass, that Jesus Christ is “God from God, Light from Light, true God from true God, begotten, not made, consubstantial with the Father” . I am not very happy about using the term YHWH out of respect for Jews. The view that Jesus was simply a human being, especially favored or “adopted” as the Son of God at some point, usually either at his baptism or at his resurrection. Adoptionist views were espoused by some early Jewish-Christian groups, by Elipando of Toledo in the eighth century, and by Abelard in the twelfth. Joseph A. Komonchak et al., The New Dictionary of Theology (electronic ed. ; Collegeville, MN: Liturgical Press, 2000), 8.. I know the views presented here were, are and will be rejected by the Catholic Church, however I am more interested in what God accepts and rejects. 2. The divine nature can be bestowed upon whosoever the Father wills to bestow it. He bestowed the divine nature to the Son after His resurection. By definition God can’t die no matter what ipostasis He takes. Our Lord died on the cross (He did not have the divine nature) but after His resurection the Father raised Him to a higher glory (the divine nature). Romans 6:9 shows the fact that after His resurection he no longer can die. A change of nature has taken place. 1Tim 6:16 also confirms that God can’t die. LORD (YHWH) and Adonai are 2 different things. 4. It is possible to change from spiritual or human nature to divine, the first who did this was the Lord Jesus, and the next will be the Church His Bride and Levites who will bring salvation to mankind during the Millennial Reign of Christ. Christ (Annointed)is no longer one person but made of Head (Jesus) and body (Bride/Church/Levites)This complete Christ will bring salvation to all mankind willing to obey God during this Millennial reign. Moreover the apostles always attached the word God only to the Father in their epistles. “In the beginning was the Word: and the Word was with God: and the Word was God. The same was in the beginning with God. All things were made by him: and without him was made nothing that was made. In him was life: and the life was the light of men. And the light shines in darkness: and the darkness did not comprehend it.” These words open John’s gospel – the gospel of Jesus Christ, right? Well said, Mary. Noelfitz & Agape: here we are confronted with neo-paganism overrunning politics and culture in the West, and you want to rehash a 5th century heresy? Respectfully, I disagree with you, as Agape’s comments are not about politics or culture. In fact Nestorians never fully disappeared. The Coptic Church, the main Christian Church in Egypt, believes in Nestorianism now and has always done so. Members of this Church are being persecuted at the present time. Besides the Orthodox Greek Church there are scattered in the East…ancient Christian sects, the Nestorians and Monophysites. They represent petrified chapters of Church history… They owe their origin to the Christological controversies of the fifth century, and perpetuate, the one the Nestorian… They show the tenacity of Christological error. The Nestorians protest against the third oecumenical Council (431), the Monophysites against the fourth (451). In these points of dispute the Latin and the orthodox Protestant Churches agree with the Orthodox Greek Church against the schismatics. The Coptic Orthodox Church of Alexandria is the official name for the largest Christian church in Egypt and the Middle East. The Church belongs to the Oriental Orthodox family of churches, which has been a distinct church body since the Council of Chalcedon in AD 451, when it took a different position over Christological theology from that of the body of churches that would later split into Eastern Orthodox and Roman Catholic churches. The precise differences in theology that caused the split with the Coptic Christians are still disputed, highly technical and mainly concerned with the nature of Christ. Christ did die, and so did God, but God died and shed His blood according to the human nature that He took on in the Incarnation. Christ is of two natures united but unmixed, totally man, and totally God. I believe Agape is confused into what the doctrine means per se. 28 Take heed to yourselves and to the whole flock, wherein the Holy Ghost has placed you bishops, to rule the Church of God which he has purchased with his own blood. Herein we see that God has indeed purchased the Church with His own blood, God has shed blood by His human nature, not His divine nature which has no blood and cannot experience loss. 14 That you keep the commandment without spot, blameless, unto the coming of our Lord Jesus Christ, 15 which in his times he shall show, who is the Blessed and only Mighty, the King of kings and Lord of lords: 16 Who only has immortality and inhabits light inaccessible: whom no man has seen, nor can see: to whom be honour and empire everlasting. Amen. You also are confused into what it means in terms of change in nature. Human nature is both spiritual and physical, we have souls, we do not convert natures upon death, you are using a definition of nature that is completely alien to the Church’s usage of the term nature. As I have shown from Acts 20:28, the Father is not only to be considered God, but the Son too, for does it not say in John 1 that the Word was with God, the Word was God, and that the Word took on flesh? Christ was with God, He is God yet distinct from the Father, and became incarnated for the salvation of all men. You are also confused about hypostasis, God does not change hypostasis in becoming man. God does not change His Person in becoming Christ, for Christ is one Person, both of divine nature and human nature. Further Romans 6:9 only talks about Christ dying no more. This is true of all men, once they die they will die no more [immortality of the soul]. Christ is not the first to have become a soul disattached from the body, look at the Transfiguration where Moses and Elijah were both present in spirit but not body. Christ is the first resurrected in the true sense (not resuscitated as Christ did in His miracles during His ministry) and was given a glorified body. Yes, God did die on the cross, but not in His divinity, only in His humanity. That is the divine nature of Christ is immutable, He is God, bu the human nature of Christ underwent death. Go to newadvent.org and look it up in the Catholic Encyclopedia if you want to learn more about the Catholic faith. I would not say that the Holy Spirit is the ‘sperm donor’ because the Holy Spirit is not carnal; He is not material. Rather the Tradition implies that Christ was woven or created in His humanity entirely from the flesh of Mary. Is it not possible that He who could raise men from the dead, create the universe, and more, could take from the flesh of Mary to alter it so as to make Christ’s humanity? God bearer and Mother of God are in the most part synonymous, God-bearer is just a name given to a greater reality, Mary being the Mother of Jesus Christ who is God, thus Mary being the Mother of God. Noel, please don’t answer for Agape or get in between my direct address to Agape. I am interested in Agape’s understanding of the Trinity for a good reason, even though I already acknowledged that Agape obviously does not believe in it. Agape, your thoughts are welcome here despite you having entered a site where you knew yours is not the predominate view. Let’s talk. First, I do not want to stir something just to have your precious time and my precious time occupied with never ending polemics, which have been discussed along centuries of Christian history. I want however to point to some inadvertencies and contradictions that every sincere Christian can’t reconcile with the knowledge he/she has. I had the same questions unanswered for years nagging at me every day: How can God (which is immortal by definition) die on the cross?, how can God which is Love can torture people for ever in hell? Why is He going to burn the whole Earth and save but only a few? Etc. etc. I came to this web site by accident after google-ing: st. bartholomew massacre which took me to: newadvent and then here. Anyway, I know that these ideeas have been debated for a long time in history and always ended up just like they started with split ideeas and groups. But is no surprise as we were warned that the word of God can split even the families in factions. But every debate makes the parties go to the Word of God to find answers and that is good as it keeps us occupied with studying the Bible which is good. Now coming back to our subject, I have said that the way I understand this subject is that the word: God or god or GOD as it written in manuscripts means: a powerful being. Moses was one (Exod7:1) the judges of Israel were gods (Psalm 82) and there are many others out there (1Cor. ch.8) Our Lord was a powerful being, He had a spiritual nature before being born as a perfect man. He came from the unseen spiritual realm, was born as the perfect man, lived the life of a perfect man and died for our sins, (not His) as a perfect man.This way an equivalent price was paid: a life paid by the perfect man Jesus,for the perfect man Adam. The fact that Jesus was a perfect man on Earth is shown by apostle Paul in 1 Cor 15:45. He goes on confirming once again that the divine nature of the Son was bestowed upon Him after His resurection therefore He is NOW a life giving spirit being (just like the Father the source of life). And trying to make this short, this is how I understand: God the Father (YHWH)has created His Son Jesus Christ as a spirit being, on the spirit plane, and in turn the Son created under the direct supervision of the Father the worlds we know from the Bible: Spirit world and material world – our Universe in which we live. The plan of Salvation included the experience of human race with evil, so the humanity can learn what disobedience brings, the creation of a class of priets (Levites)which will recieve the spiritual and divine nature and which will be God’s personal friends and mediators for mankind in the future when Christ (complete now) will bring salvation for the whole world.The rest of mankind will not be transformed to a spiritual nature, but will continue to live as perfect human beings here on Earth after they have passed the test of obedience to God during the Millennial reign of Christ.It is in this time that the world is tested, right now only the Church/Levites/Bride of Jesus is tested. They will be the future government of planet Earth, ruling from Heaven as spiritual beings. Natural Israel will be the visible/tangible part of the this Kingdom with no end. They will rule here on earth under direct supervision of Bride-Church/Levites which in turn is under God the Father (YHWH). The Head of this Christ is Jesus our Lord and Savior and the body the believers who are tested now by accepting the Truth of the Word of God (Bible). Agape, let’s try one thing at a time. Let me start at your ending. Do you think that Catholics do not believe in a future bodily existence for righteous human beings? Please note that this is a yes or no question. Also, did you not mean for your last sentence to be: “The Head of this Church is Jesus our Lord and Savior and the body the believers who are tested now by accepting the Truth of the Word of God (Bible). It’s hard to answer with Yes or No questions. There are important details to be discussed. The view of Catholic Church for the future is very confusing just like the rest of the teachings. Maybe this your chance to clarify that aspect. Never have I encountered a clear description of what future looks like under the reign of Christ. What I know is the fact that Catholic Church teaches that God is trinity, believes and teaches immortality of soul, and existence of Hell as a place of torture for those who reject the Gospel. None of these views I share, as I believe that God is YHWH the Father, the soul is the person itself and when the person dies, the soul dies. I also believe that the punishment for sin is death and death is the opposite of life. In Sheol there is no thinking, acting, feeling, …nothing. These are but a few of many other things which I see and understand differently. As for the second part, there is no mistake, I meant just that namely that the Christ (Head-Jesus) and Body-Church/Bride/Levites) will reign for 1000 years with the mission to re-educate mankind and bring it back in harmony with God, as it was intended in Eden. I asked because I think that some non-Catholics are under the impression that because we talk about “heaven” so much, that we are not aware of or have forgotten that we are promised a new heaven and new earth. We confess that we believe in the resurrection of the body — for all. A human being is body and spiritual soul united. Yes the soul is immortal, but the soul longs for the resurrection of the body; the human person was not created to be a mere spirit. God promises a bodily existence and an earth in which to live that existence; only not an earth any longer cut off from heaven, as ours is now. Instead, one which participates in the glories of heaven, just as our resurrected bodies are made spiritual. A body that is spiritual, is not spirit anymore than for you to be musical means you are music. The ancient orthodox illustration is of iron heated to glowing hot in a furnace. The iron takes on the qualities of fire — it gives off heat and light; if it touches another object it can set it aflame — but it has not become fire. This is the case with our spiritual resurrected bodies — they are so united to the spirit that they take on some of the qualities of spirit, but they are still physical bodies. We do know what some of their qualities are because of the example of Jesus’ resurrected body since we are promised that our bodies will be gloried as His was. Further details are yet to be revealed according to the scriptures, and are likely beyond our current ability to comprehend. What you are proposing is a two class system of salvation, in which some humans cease to be human, becoming pure spirits, while other humans are “recreated” or “cloned” to live in earth. (We cannot call it resurrection because according to you they would cease to exist at death.) This is not biblical and in fact, no one in all the history of the Church ever proposed anything like this until the late 19th or early 20th century. I am well aware of how out-of-context and misinterpreted scripture can be strung together to make this case, but the problem you have is not “studying the Bible” but having a Bible to study at all. This is because every time you pick up the Bible and claim it is your “authority”, you are crediting the authority of the Catholic church which produced and compiled the Bible. If you do not think that this apostolic Church has the authority to interpret it, then you simply have no Bible to study. The same Church councils that ruled on what constituted scripture ruled on the divinity of Christ. This is where it gets confusing. The mixing of spirit plane with the material plane. In my opinion there are 2 distinct Universes. One is the spiritual Universe or Cosmos or Realm or whatever name. This spiritual Universe is comprised of spiritual beings: Angels Cherubims, Seraphims, etc. They live in this Universe. The other is our material Universe everything and anything that is tangible. Stars, planets, man, Earth, etc. is part of this Universe. Angels don’t live in our Universe and man can’t live in a spiritual Universe. Absolutely all creations of God are subject to death if disobedient, Son included. But the Son has shown His love,devotion, obedience,etc, to the Father and the Father has rewarded Him with His divine nature: immortality. NOW, death has no power over Him. Both worlds are ruled by God the Father, He is the ultimate ruler. He existed from infinity of time and will continue to exist in infinity of time. God created His Son Jesus which in turn created these 2 worlds we learn from the Bible. The beings populating these 2 worlds are designed to live in these worlds just like man is designed to live on Earth and the fish in the water. The spiritual beings can materialize in our world taking human bodies. They can eat our food, etc. We learn about this also from the Bible. Man can’t live in the spiritual world because he was created “lower than the angels”. Man’s habitat is the Earth. He corrupted some of the angelic beings thus they became demons, agents of evil. Human race due to disobedience of Adam and Eve have entered under his rule. But God knew that something good will come out of this: the experience with evil. Because all beings were created pure initially they could not understand what evil is. Now both Universes can see what evil is and where it leads: pain,suffering,death. This was the lesson necessary for both Universes to learn and understand why obeying the Creator is necessary. Once the lesson is learned, evil will be terminated, will become extinct, out of existence. The lesson is in progress now on Earth, angels are watching, mankind is experiencing first hand. Now I will try to answer the second part. During the beginning of Christianity there was no such thing as Catholic Church. Just Christians-followers of Christ. To these fine man we owe the Bible as we have it today not to a certain group or denomination. These formed later and unfortunately they fulfilled the prophecy with the tares sown after the last apostle went to “sleep”. Satan could not do anything with his tares until the apostles were taken out of the way. He tried before but the apostles were correcting the errors (tares). Just look at Corinthians how far deviated from the truth, it was necessary 2 epistles from Paul to correct them. But as soon as the apostles fell asleep in death one by one, errors started to creep in. Three centuries after the fall was complete. The Niceean creed has become a triumph in a bad sense. The true character of God has been turned into the mirror image of Satan by adopting the diabolical teaching of Hell which dishonors the Father as He is not a torturer which even Torquemada or entire Inquisition would pale with envy. He is Love, and Love does not do the horrors ascribed to Him. Furthermore the teaching of trinity was adopted and made law for every Christian. Arius was a defender of truth but the truth was treaded down (Isa 59:14, Dan 8:12) Immortality of soul was conceived there at Niceea even though God tells us through His messenger Ezekiel that the soul (person) that sins will die. And the list can go on and on with the raising of the Nicolaitians (Nikeo=victorious,lord and Laikos=Laity, regular people) the rising of Jezebel the whore, etc. This was necessary for the true believers to be tested and found worthy of their future role as mediators from Heaven to humanity on Earth. But God did not suffer that this fall go on indefinitely. After the darkness it was plunged into, He has raised 7 angels (messengers) sent forth with their 7 trumpets (messages) to clean and restore the initial Gospel. So, now the 64.000$ question: Where did I learned all these? From the 7th messenger, which has finally cleared up the confusion. By the way another word for confusion is Babylon. And who is this 7th messenger? This is a homework for every sincere searcher of the Truth, to search, to ask, to make sense of what God has designed for His creation. Blessings to all of the readers. I had considered that for a human there needed to be a father and mother, and that the Holy Spirit, who is God, was the Father of Jesus. “Joseph, son of David, do not be afraid to take Mary as your wife, for the child conceived in her is from the Holy Spirit.” (Mt 1:20b). The angel said to her, “The Holy Spirit will come upon you, and the power of the Most High will overshadow you; therefore the child to be born will be holy; he will be called Son of God (Lk 1:35). God is almighty and he could take the flesh of Mary to make Christ’s humanity. Would you like to give me some references to the tradition you mention? I am intrigued to know if Agape comes from an Egyptian (Coptic Christian) or other background. Would Catholics consider the views heretical or schismatic? I do not think the belief represents neo-paganism. I am grateful for you for developing this topic. I see you wrote “that is why Christ says in the Gospel of John, before Moses was, I AM”. Were you thinking of John 8:58: “Jesus said to them, “Very truly, I tell you, before Abraham was, I am” ? You are correct regarding Abraham, that was my mistake. The Father is the Father of Christ (the Word who is the Son of God) not the Holy Spirit by Who’s power Christ became incarnate. The Father is the father of the Son of God, and Jesus Christ is one divine Person, the Word incarnate so the Father is still the father of the Son. Concerning the Oriental Orthodox and ‘Nestorian’ churches as well as Monophysites, that amongst the Orthodox and even Catholic Church that it is largely thought that the controversy was over language used and not necessarily doctrine. My understanding is that the ‘Nestorian’ churches would say that Christ is one Person, fully human and fully divine. Much of the problem was concerning philosophical language used at the time, since there was a subtle shift in the terms being used from the Council of Ephesus to Chalcedon. many thanks for your post. This has been interesting, as it encouraged me to think more deeply about my beliefs. Faith seeking understanding. Search out the doctrines of the Church, she is like a mansion with many rooms (a foretaste of the real mansion with many rooms, Heaven). I’ve been learning about the Church for about 3 years of personal studying and I still discover new things about her, new things that bring me to awe about the workmanship of God. The beliefs of Agape are those of the now defunct Worldwide Church of God. Herbert W. Armstrong and his son Garner Ted Armstrong had a split on the church’s doctrine. This is why this discrepancy lives on. They can not reconcile the Father with the Son in any other way but heretical. I’m with Robert Struble Jr. on this one. The same heresies keep being rehashed under different names. It bears repeating – the poor defunct devils! I am unable to see posts after that of Goral on 1 Jan at 10:44. Previously a similar result happened when there were many replies to an article. If you reply here I may not be able to see it. Agape, I really, really understand where you are coming from. More than you know. Here is the problem you have. We could play scriptural checkers all day long when it comes to interpretation. The bottom line will be who you trust as an authority. I am not going to play 7th messenger game with you, because there are so many who claim that title. Jehovah’s Witnesses will say it was Charles Taze Russell for example. Your problem comes in when you start to make historical claims, because then you are talking about something for which there is a record and documentation, that is not open to interpretation instead it is a matter of historical record. Take note of those who hold heterodox opinions on the grace of Jesus Christ which has come to us, and see how contrary their opinions are to the mind of God … They abstain from the Eucharist and from prayer because they do not confess that the Eucharist is the flesh of our Savior Jesus Christ, flesh which suffered for our sins and which that Father, in his goodness, raised up again. They who deny the gift of God are perishing in their disputes. When we Catholics read these things, we recognize the worship and the doctrines as being Catholic. So we know the Church was Catholic from the beginning. You have no evidence at all for your fabricated version of history — I’m sure you are not to blame; somebody foisted this off on you. I used to believe as you did, until I examined the historical record. The record of the bishop of Rome goes back to Peter. We know the name of every bishop who held that seat and the first thirty-one popes were martyred! They were killed in the Roman arenas or executed by the emperors. Ignatius of Antioch was also killed by lions in the arena. We have the record of the deliberations in the councils regarding the authenticity of the books of the Bible and also the great theological questions. We know how and by whom these decisions were made — we can name names and dates. You can’t name a single person to whom you think you owe the Bible — not a single one. You can’t name a single early Christian executed by Rome who was not part of the Catholic Church. What you are believing in (and I’m not talking here about what you think scripture means, but what you think happened with the early Church) is someone’s bold-faced lie, completely manufactured to get you to trust their interpretation of scripture. It did not happen. It simply did not happen. The Catholic church of the 21st century is the Catholic Church of the 16th century, which is the Catholic Church of the 10th century, which is the Catholic Church of the 5th century,which is the Catholic Church of the 3rd century, which is the Catholic Church of the 2nd century, which is the Catholic Church of the 1st century, which is the Catholic Church of the apostles and founded by Jesus Christ. If you are sincere about wanting the truth and wanting to please God, then you will look at the evidence and you will find that you are being lied to and that the person or persons you are trusting to tell you how to interpret scripture have no legitimate spiritual authority. They do not speak for God; they are liars and they are misleading you. First and foremost I have to respect your approach to this situation. Unlike many others which can’t bring a sound argument from the Bible and just shoot cheap shots (some on this forum), you have shown at least sympathy and patience. These are qualities hard to find in people nowadays. That part I respect. Now, I will attempt to show you my line of reasoning and logic. It starts with the Bible. You see, even though you think that the Bible is the masterpiece of the Catholic Church I happen to believe that the Bible was given to us by God as an instruction manual. This instruction manual contains all the information we need so we can understand the plan of God concerning His creations, us included. To me it makes sense that only the Bible is reliable. I will not spend my time studying or replying on blogs about tradition, since I believe that the word of man is not as reliable as the Word of God. Furthermore we are told by Isaiah that anything we hear we have to compare to His word and check. (Isa 8:20). Our Lord always replied with: “It is written”. So I must. If I want to understand something I must study more than one prophecy, in other words more than one witness. This also appeals to my logic since one nail in a wooden board will not fasten it. With only one nail you can still turn the board in any direction you want. Two nails (witnesses) at least are need it. These 4 major attributes are always in balance, always in control. Justice condemned Adam in Eden but Love provided a way. Now, my logic tells me that any teaching coming from anyone must be in accord with the Bible as Isaiah said and must not come in conflict with these 4 major attributes. We can go on for a very long time but to answer your question: whom do I trust? I will trust anyone who can show using Scripture that God is love, as it is written. I will trust anyone whose teachings do not conflict with any of the 4 attributes mentioned. I will trust anyone who can show a logical flow, a loving plan that includes the Jews and the Hindus and the Mormons and the Muslims and the… Christ’s blood was shed for them too. I will not trust anyone who puts the word of man on equal footing with the Word of God. I will not trust anyone who describes God as someone like Torquemada, I will not trust anyone which brings shame and defamation to my Father’s name. Agape, my point regarding Russell was irrelevant to the consideration of whether the current JWs accept all his teaching — my point was that they consider (or once considered) him to have been the 7th messenger — I’ll remind you that you are the one who brought that up. You are eliding. That means you are attempting to slide past something without dealing with it. It does not matter how very “logical” or even if you are illogical in your interpretation. First of all, it is not “your interpretation” anyway, because you did not come up with it. so regardless how logical you think it is, the logicalness or the illogicalness of it does not belong to you. You have received it from someone. You were not walking along the street and a Bible fell from the sky into your hands and whoola, you read it and came up with those doctrines. Second, as I said, you are not merely making claims about scriptural interpretation here. You have made very specific HISTORICAL claims and have not yet backed up a single one of them. Once again, I am not playing scriptural checkers with you — which I am very capable of doing — because ultimately your problem is one of authority. The authority in which you have placed your trust has talked a good game and effectively taught you the very limited approach to scripture that I was also taught from childhood — proof-texting. Well, a text without a context is a pretext and the correct context for understanding scripture is in the Catholic church. This man was a direct disciple of St. John (the apostle). So the congregation at Smyrna knew who he was. They preserved his letter. They understood his letter. They knew what the Eucharist was, about which he was writing. They knew what a bishop was and that the bishops ordained priests to offer the Eucharist. They knew what he meant when he spoke about the Catholic church! So here is a historical refutation of the so-called history that you presented. Are you humble? Do you REALLY love the truth? What matters more to you, WHO is right, or WHAT is right? I have demonstrated and proven that the story you have in your head about how the Bible and the Church came into existence is false. Do you have enough love of the truth to admit that? Will you deal with these questions or will you try to slide past them once again and attempt to deliver another lecture from your canned set of scriptures? I will not deal with you about any of the scriptures until you get the history right, because everything you say is based upon a false authority that has made a lying historical claim. Until your mind is disabused of that lie, you will not have the ability to properly evaluate a presentation of scriptural doctrine. In Acts 17 we are given the example of those searching the Scripture. Our Lord always replied: It is written. I follow these examples. In Thess. Paul said that the believers could rely on his words just like they could rely on his letter as they did not contradict. What he told them was what he wrote them. Besides, what traditions was he talking about when they were the first? You also never gave me a clear explanation of how you see the Plan of God. You find refuge in historical claims, sayings of famous men, church doctrines. What you failed to see was that a lot of questions addressed to me, actually applies to you too. I am not interested in backing up historical claims; we are not debating the accuracy of history here, but the accuracy of teachings. You know, you brought texts of St. Ignatius. I am curios if you can tell me what did he said about the text in 1 John 5:7. Can you find anyone in early Church history that debates this text? I wish I could bring you some texts from Arius’s work, but I can’t. You know why? Because he was slapped, discredited, and poisoned. His books were burned, a trend which continued through history with other great men. Some were burned along with their work, some were tortured to recant. It’s easy to destroy the work of the opponent and then bring “proofs” from your own work. Why the killings? Did the Lord teach to kill the opponents? Did He teach torture? You elided this point discussing traditional history. Is this what I am called to? Thanks, but no thanks. In Luke 9 we see the approach. Our Lord’s reply in verses 55,56 shows us the way we should act. Ah, good we are getting somewhere. Yes, they were the first generation of Christians, right? So what traditions was St. Paul saying he had delivered to them? Well consider this, here you had functioning congregations of Christians (and you had a lot of them in diverse places). They were worshiping, making disciples, engaging in catechesis (teaching the faith), caring for the poor, etc. But the New Testament had not yet been written — just a few of St. Paul’s letters had started circulating. How were they to know what the gospel was? How were they to know how to interpret the Old Testament (which they were using for liturgical readings just as the Jews did)? How did they know how to celebrate the Sacrament of the Altar, which was their highest form of prayer? How could they do all these things without a New Testament? That is where the traditions that St. Paul talked about came in. These were the traditions of the apostles, to whom Christ had said, “He who hears you, hears me.” The Apostolic tradition was from Jesus. And it was passed on, not in the form of a book, but by personal instruction and example. That is why St. Paul could say to Timothy, “And the things which thou hast HEARD (not read, heard) from me among many witnesses, the same commit thou to faithful men, who shall be able to teach others also” (2 Timothy 2:2). There you see the first four generations of Apostolic tradition — St. Paul to Timothy to faithful men to others. Now which of those generations was Ignatius in? Well he was a direct disciple of St. John. So he would have been in the second generation from an apostle, but since St. John lived so long, Ignatius might have been contemporaneous with many who were third generation in that line of faithful men St. Paul talked about. I don’t think Ignatius commented on John’s epistle, but you can read all of his writings online. (I recognize the irrelevant little controversy about the Trinity you are trying to drag me into with this verse, but as I told you, I am not explaining doctrine to you because you are not ready for it.) Remember, Ignatius was brought into this conversation to refute YOUR contention that the Catholic church did not exist in his time. So now do you concede that the Catholic Church did exist at the earliest days of Christianity? Now you assert that St. Paul is telling the Thessalonian congregation that what he said was the same thing he wrote. You can assert that all you want, but the text doesn’t say that. It says they should hold to both what was delivered to them orally and in writing. You can probably read all of 1st and 2nd Thessalonians aloud in under half an hour. Considering the amount of personal time St. Paul spent with them, it is just silly to think that everything St. Paul said and did in the way of instruction and example is contained in his letter. Look at 1 Thess 1: 5, 6. But with this question, you are really starting to think about these things from a different angle. You are starting to think about what things might have really been like in the early church which did not have the Bible in the way we have it. You are wrong when you say that we are not debating the accuracy of history. I don’t take kindly to hit and runs and you won’t get away with them here. Every time you make false claims about history I am going to call you on them — even when they are implied as you seem to be implying above that Arians did not persecute, hound, exile, imprison, torture, and kill Catholics (and Donatists) but were instead mere victims. Wow! If you think that, your ignorance of history is really astounding. Why the killings? You tell me. Why did Constantius (Arian emperor) launch a massive persecution among the Catholics in Alexandria? Why did the Arians starve imprisoned women? Scourge the bishops? Why did the Arian King Huneric have Aemilius flayed alive when he wouldn’t convert and have Servus dragged to death? Thank you for the reminder about one of our favorite Christmas songs “I saw Santa slapping Arius” (JOKE!). Now there is nothing wrong with burning heretical books! But WE AGREE that human beings should not be mistreated. Sadly, there is no group that has never oppressed and mistreated another. This INCLUDES Arians. And it includes Arians today, even. So don’t try to come on this site and claim to belong to some perfect group of people who are not sinners, who have not ever persecuted others, who are always peaceful, bla, bla, bla unlike you bad sinful Catholics. That is bogus and very lame. As for your (out of context) citation of 2 Tim 3:16 — I will deal with that in an article (actually 3 of them). Starting shortly. Noelfitz, when you read my post you normally don’t need to delve any further. I’m rethinking that in light of Mary’s last post. What a way to go into the new yr. with confidence that the authority most of us love and trust is the Pillar of Truth. Thanks to Mary and others, who make it their toil, so that the rest of us can have access to this wonderful forum. I encourage everyone to support this any way you can so that we can enjoy and benefit from CL, yet another year. God’s blessings for the New Yr. I agree with you fully about supporting CL. It is a blessing. Mary requested that I do not interfere with the discussion between Agape and herself, this is good advice because both of them have experience and knowledge of the issues involved more that I have. I was very impressed with Mary’s clear, charitable and powerful explanation of the Catholic position. I am also pleased she mentioned the Apostolic Fathers, Ignatius of Antioch and the Didache, as they are my principal interests at present. I am also impressed with Agape’s reply. Agape seems a person of integrity and good-will and I wish him/her every blessing in the search for the truth. PS: I had problems seeing all posts in this discussion, but Mary helped resolve the issue.Thanks! and the tortures… and the poisonings… and the two fingers in the eyes so they could not read their own bibles and make up their own minds? Right about now Noelfitz, Mary could use some interference as there is so much “splaining” to do. Just as St. Cyril of Alexandria recognized that “Nestorius’ Marian theology was a symptom of a much deeper problem”, we need to recognize that we Americans have a particularly unique conundrum with theology; that is Jeffersonian democracy extended into the religious ream as Jeffersonian theology. The thinking here is that the success of one automatically guarantees the success of the other. This will one day be cited by history as a blunder of enormous consequences. Our educational system developed this folly further by neglecting to teach critical thinking, philosophy and logic. As a result, citing historical records and documents is dismissed in favor of “what it means to me”. We worship the “god of our choice”, all of this touted as one of our highest achievements. Centuries old enemies of the Church whose heresies were convincingly and rationally rejected have found a portal from their netherworld into the modern world, mostly through the crafty use of the English language. Their demons have identified in modern Americans, the tragic flaw that weeps for them and resurrects their soul-damning assertions. Who was Ignacius of Antioch that he should have more relevence than one of our contemporeries, like John Lenon or is it Lenin? These we were told have the true agape love, the others require too much mental effort and I say nothing of the spirit. We are loosing the battle for a higher civilization. Goral, at this point I would settle for a lower civilization. Coyotes and grizzly bears treat each other better than we do. They have no Declaration of Independence that promises the right to “the pursuit of happiness” (a phrase that appears nowhere in the Gospels or anywhere, to my knowledge, in a Church document), and yet they manage to avoid destroying their young – out of a simple desire to continue the species. Do human beings in America lack even the basic understanding of our creaturely brethren? Guys, we are not losing any battle for a higher civilization. Relax, God is in control. Everything that happens follows the outline laid in the Bible. God is preparing the Levites, those who will teach others to obey,listen and appreciate what God has done for them. This will happen in the Kingdom of Christ which is about to be established. Daniel has shown that a small “stone” will destroy the present order and will grow until the will cover the whole Earth. Then, a new era will begin. Evil will be eradicated, violence will stop, etc. All of the people will be resurrected and educated. Isaiah presents a few ideas how it will be when this “mountain” is established. Isaiah 25: 6-9, Isaiah 35, etc, etc. Zecharia 14 shows the punishments for those who rebel against this Kingdom. We need to hang tight a while longer. Yes, God is very firmly and adamantly in control. But our actions have consequences. Evil has consequences. What kind of future can we expect to have when we have murdered over 50 million young people since 1973, and contracepted countless more out of existence completely? We know that “evil will be eradicated” – but how do we expect that to happen? Will God simply wave His hand and make it disappear? History teaches us that fallen societies such as ours end badly – it starts with moral degradation and ends with chaos and war. We have hope for great goodness in the end – but it is at the far side of the serious consequences of our actions. I have a friend who is Christian Scientist. She doesn’t believe in sickness of any kind. I remember one day she came down with a cold. She had to do backflips to avoid admitting that she had a cold. It was the dust in the air, the temperature of the room, etc. It was the simplest thing on earth – she had a cold, so what? If you have a cold, you have a cold. Don’t deny what is right before your eyes. Our civilization has more than a cold. We are in the severest of straits. The time is now for people to wake up to reality. Denying the truth is not going to help; it will only make the situation worse. Please pray with me to Our Lady, Patroness of the U.S.A. It is our desire to control everyhting that makes us blind to reality. The reality is that no matter what we try in our human efforts to make better societies, we are doomed to fail. Humans started with slavery. The earliest form of society, based on using others which are not your own kind. Then we tried dictatorship, democracy, socialism, capitalism, comunism, etc. All of them failed to bring any relief. We are still not happy, and I believe that we will never be as long as we try on our own. I think this was the point of allowing people self-government for a while: to see that we are not capable of that. What our Lord had done while on Earth (multiplying of bread, healing of sick, resurrection of dead) was a foretaste of things to come on a global scale. Right! But how are these things to come about, by some sanitized action of God that somehow makes better without respect for the consequences of our actions – or by God working through history, respecting our actions and allowing us to do what we want, even when it conflicts with His ultimate desire? Zak 14:12 And this shall be the plague wherewith Jehovah will smite all the peoples that have warred against Jerusalem: their flesh shall consume away while they stand upon their feet, and their eyes shall consume away in their sockets, and their tongue shall consume away in their mouth. Well… is He capable or isn’t He? Is there a conflict with #2 is is it a catch 22? Frankly, I’m not worried about it! It’s we Catholics who make merry and sing and dance. We do so because we’re happy and trust in God’s love and mercy. We do so because we rejoice in His wondrous gift to us – The Church. We do so because we have the Vicar of Christ living among us. Lastly and most importantly we do so because we are fed the Eucharist at His Table. It’s quite miraculous, actually. As for the followers of sects and cults and self-styled prophets, they’re crazier than bed bugs. You can’t see that you profess what you do because you’re swimming in a swift river current. You’re not free to leisurely and controllingly swim your own stroke. Pray that the current lets you go on a sand bank where Catholics are having one boisterous church picnic. Perhaps this is the bank. A picnic? There’s food? Who’s bringing the potato salad??? Wait, it’s the 5th of January. Goral, we have to wait six months to have a picnic!!! Zechariah 14 shows that the punishment for sin is death. Ultimately all who rebel against God will be punished by death. In the Millennial reign there will be no excuse like: “I didn’t know”, because God Himself will reveal His will, His plan, His commandments. Jer 31:34. And let’s not forget that Satan is restrained all this time, no more lies, confusion, false tracks. Sinning deliberately against God when His will is made known plain and clear, brings death. That’s what I gather from this text. You see, it’s Jerusalem that the earthly people will have to come and gain knowledge. Apostle Paul in Rom 11:25 tells us that Israel has fallen until the full number of the Gentiles is completed (for what?) then he goes on saying that Israel will be delivered (why?) further confirmed by Acts 15:15-18. Clearly there is something that will serve a purpose (when?). The number taken from among the Gentiles and Israel. The vine and the fig tree. It’s also in Zecharaiah 3. Agape, I have been so patient. I know that some people reading this can’t understand why I am doing this. But… like I said, I really understand everything you believe. I know your interpretations of these scriptures you are citing before you say them. Now you have to stop. You are acting like a child. 1. Admit that you did not come up with this stuff. Stop pretending that these are your own personal interpretations. You don’t even have to tell us which pitiful little sect you are part of — we don’t care — just stop with pretending. 2. Be responsible for the things you say. When you make a statement and you are shown to have been in error, come back into the discussion with the humility to admit that you were wrong on a particular point. Just to refresh your memory, there are at least two points you have to address BEFORE this discussion will continue. First: admit that you were wrong about when the Catholic Church started. Once you do this, the conversation can proceed. This will be my last posting. I know you have been patient, but you were the one saying: “Let’s talk”. The Roman Forum was a place for exchanging ideas. This is the purpose of a forum. If it makes you feel better, I am declared “Persona Non Grata” by the Protestants as well. I can’t recant Mary, the history and the Bible don’t allow me. The Catholic Church has given the world great people which can be a model for any Christian. I have nothing against the people of the Catholic Church, but I have against the teachings of the Catholic Church. As you can see I believe totally different, I have my reasons and I have a right to believe according to my own conscience. Mind and conscience can’t be restrained by chains. 1. I already admitted I didn’t come up with this stuff, I am not that smart. Others have toiled ahead of me, I am only reaping their work. The names are irrelevant, their work is. As far as I am concerned the name can be: Ti Xuan Ling, or Giancarlo Romano, or John Doe, or…, point is, doesn’t really matter. Neither my pitiful insignificant little sect matters, I am aware of that. What matters is how we present God and His teaching to the world. 2. What Arians have done, and what their beliefs were, I don’t know as there is little information about that, and mostly from their executors, therefore biased. If they were also persecutors they were also on the wrong side. True Church will never persecute and kill, she is the one persecuted, like her Head once was. May the Lord add His blessing and forgive anything that was said amiss. Agape, you are welcome here. You are not “persona non grata.” But a real conversation involves you actually responding to what is said to you and engaging with others’ ideas. It does not mean simply coming in here and attempting to lecture us on and on like an obsessed person whose thoughts just keep swirling with such manic power that he cannot really listen to another person. I am not demanding or even asking you to recant. Where did that come from? Can’t you understand that when you say something like that you sound like you are trying to create some kind of victim-hood status for yourself that does not exist? That might not be your intention, but that is what it seems like. Ditto with the whole “restraining conscience” line. Sheesh. Come on, for Pete’s sake, talk about ideas in a reasonable way. Here is what I am saying to you and why I press the point that you did not come up with this stuff: you have received a certain teaching (i.e. “tradition”) that makes you feel like now you have been given the complete understanding of the Bible and of God’s plan of salvation. In order to accept this as the truth, you have to trust whoever has taught it to you. You have to accept him/her/them as authoritative in the matter of interpreting the scriptures to you. 1. create an aversion and mistrust in your mind of the Catholic Church (and even of orthodox Protestants) so that you will not listen to the teaching of the Apostles of Jesus or even the modern disciples who know Him. If they can be proven to have lied about the historical narrative, what happens to their authority? I think it can be demonstrated that they have lied. I am asking you to have the courage and the commitment to the truth to examine what you have been taught in the light of history, logic and scripture. I put scripture last because until you recognize that they have lied to you and are able to look at scripture without the interpretative lens they have put over your eyes, discussing scripture will get us nowhere. If you want to question the authority of the Catholic Church in this same historical fashion, have at it. We are happy to accommodate you because we have nothing to fear. We do not have to lie or hide anything. Agape, the examination I am asking, begging, you to do, is one that I have done. I once believed very much as you did. I understand you. Later today I will start posting the series on sola scriptura that examines 2Tim 3:16. I hope you will stay and comment on it. Mary, I was listening, even checked your biblical arguments, hence I was able to see the missing of Galatians on the presentation of paradosis. I answered every time with a point by point answer. I am not attempting to lecture anyone, I simply explained my background, and the reasons I believe this way. If I was just to give you a Scriptural reference without giving the background then you have said: You are trying to hit and run. The victim-hood status was not created by me. It was created centuries ago throughout the entire history. History and Tradition have marked them accurately. It was from newadvent website that I found out about the medals given in the Night of St. Bartholomew. I did receive this teaching, I have admitted twice already. This teaching gave me a complete understanding of the Plan of Salvation, an understanding that I did not have before, neither have I encountered elsewhere. Do I know absolutely everything? No. I know everything that I need to know at this point in time. 1. Look, nobody has to give me a view of history from their perspective. I just told you that many information comes from Catholic resources. I am free to interpret that information, I have a brain and a mind to process. The aversion and mistrust is created in my mind when I see how far off the Gospel has been taken. Evanghelion means: Good News. What I described here I believe to be the original Good News. No authority is needed to see that the modern Gospel is no Good News. Any person with common sense can see that. If you think that the apostles were sent to save as many people from flames as possible, I think you are mistaken. They were sent to make disciples. Disciples who will sit at the right hand, and judge, help,intercede, guide. If they were sent to save people from flames the Holy Spirit would not have stopped Paul from going to Asia. 2. To understand the Scripture, there is no need for human authority. Just time to read it, prayer, and common sense. The Scripture has all the answers in itself as I have shown. If you REALLY want to, I will come back whenever I have a chance. Otherwise I will leave, I don’t want to be an uninvited guest at a party, no party pooper. I have enough decency to do that (leave). This past days I was off from work I had some time and I decided to join this discussion group. A forum is for exchanging ideas, and that was my intention. Our little, pitiful, little sect does not want to convert anyone, we only present the information, the listener makes that decision if he/she wants to. Since I told you that we don’t have to save anyone from fire, our motivation is different: present in peace the Truth once given to the Saints. That’s all. How can you call the gospel preached by the Catholic church “modern” when it goes back to the apostles? If there is no need for a human authority, why did Jesus choose apostles? If the Bible is all we need, how did the apostolic Church function without the New Testament? There are Catholics living happily and celebrating in both hemispheres. PrairieHawk, do you want to be the one telling the Brazilians that they have to wait til July? I was once down there just before Christmas. As I was doing my catholic stroke across the outdoor pool, I noticed the Christmas decorations. They seemed out of place to only me. We’re ubiquitous or is that universal – same thing. We use both sides of our brain. We love God and Mary the Mother of God. We even love what we don’t quite comprehend, like the Trinity. Why this love-fest? Because He loved us first. I will celebrate this month with hot, spiced Mead, pickled herring and borscht. We don’t all need to live in Atlanta. The Son keeps us warm wherever we are. You claim that the teaching of Catholic Church goes all the way back to the apostles.I also claim that the understanding I am presenting here goes back to the apostles. So, we have 2 views 180 degrees out of phase. How is this possible? Obviously there is only one Truth, can’t be more that one, it’s absolutely impossible. So, how do we establish which one is it? I missed a point from the question: How did the primary church survived without the New Testament? That’s easy: The apostles were there. If one had a question all he/she had to do was to ask the apostles, or write to them.When we have a question we should go also to the apostles for answers. That is correct. that is why the apostles left successors. When I said we have to go to the apostles I meant Bible. That is where their thoughts, directions, advices, etc is given. Written word it’s much more important than the spoken word. The best example that this is the case is when two parties agrees on purchases or any other dealings they put it in writing.Very important! Why is this union desired? What’s so important about the erasing the differences, let’s be friends, type a deal? What will happen with past anathemas, bulls, etc. Will they be revoked? Erased? Forgotten? How will a union of Catholics and Protestants be? Will they agree on something like: Don’t ask don’t tell? I am talking about tradition for example. And what about us? The “heretics” those “insignificant little puny tiny sects ” or “bedbugs” as said previously. I know you think it’s okay to burn our books but what else will you agree on with the daughters? I am saying daughters because correct me if I am wrong the Catholic Church sees herself as the Mother Church, right? But there is nowhere in the Bible that the apostles say to go to the Bible! They wouldn’t have because they didn’t have “the Bible” as we know it. So the idea that what the apostles taught about EVERYTHING is in the Bible, is an idea that is not in the Bible. What is the pillar and bulwark of the truth? Is it the Bible? We aren’t trying to create a “union” of Catholics and Protestants. We do think that the divisions among Christians are very sad and that one of the evidences of the Holy Spirit working in a Christian is a desire for unity. Agape, you wrote: You claim that the teaching of Catholic Church goes all the way back to the apostles.I also claim that the understanding I am presenting here goes back to the apostles. This is why I talked about history and logic. We go back and look at the history. First logic. You have to understand the difference between what something SAYS and what it MEANS. for example, Jesus said, “You must be born again.” Now just those two words “born again” are given multiple meanings by several Christian groups. Now regardless of how “clear” (the technical word is “perspicuous”) someone might claim the meaning of “born again” is, the simple fact that so many Christians who revere the Bible can read those words in context both of everything else Jesus said to Nicodemus and in context of the entire NT, STILL manage to disagree about the meaning shows that what it says is one thing, and what it means is something else. What is says is just those words, but in order to follow through on those words to “be” born again, requires INTERPRETATION. But remember, all the various churches throughout the known world in the apostolic times were making “born-again” Christians BEFORE the NT was even written.So our question is, well how did the apostles interpret those words? The only other use of the words born again in the entire NT are at 1 Peter 1:23 — and that does not tell us HOW to be born again. What was the practice of the apostles regarding this? How can we know? Now for a Catholic this is easy, we just look at the practice of the Church which we know preserves the apostolic tradition, but how would a non-Catholic find out. Is it possible for someone who has not yet come to trust the Church to find this out — we hope so because Jesus said it was necessary! This is why we Catholics recommend to you and other non-Catholics the writings of the men who knew the apostles, who were carrying on their practices and traditions. And we are blessed to have a very extensive record of their writings — they are called “The Early Church Fathers” and the first generation of them are called the “Apostolic Fathers” because they are contemporaries of the apostles, co-workers with them. From them we can find out what the practice of the early Church was about being born again — or anything else. That is why I pointed you to the writings of Ignatius of Antioch who was a disciple of St. John and was appointed the bishop of Antioch by St. Peter. When he was on his way to Rome to face martyrdom in the arena, he wrote 7 letters to 7 churches. Three of the Churches he writes to are ones that John addressed in Revelation. We also have a letter he wrote to Polycarp, who was another apostolic father, disciple of St. John and was also martyred. The other apostolic father whose writings we have is Clement of Rome who was ordained a bishop in Rome by St. Peter. We have a letter he wrote to the Corinthians to settle a dispute they were having. (Note: this letter was written during the lifetime of St. John and for along time it was circulated and read in the churches along with the letters of the apostles, but when the 4th century bishops decided on the canon of scripture, they decided not to include anything outside of the apostles’ own writings.) You can read the ECF writings for yourself. They are all online. Basically you believe that when 2 opposing views such as we have presented here are head to head, the only way to reconcile them (correct me if I am wrong) is by going to: 1.history 2.tradition 3. Bible. In a previous thread you said that this is the order. The early Christian history was written by Church Fathers, correct? Their sayings were handed down and thus we have an uninterrupted thread from apostles right? Just reading the Bible doesn’t suffice as we need the guide of Early Church Fathers to keep us from erring? Now let’s imagine for a moment a certain scenario: A Catholic couple together with their boy decided to spread the Good News to the remote region of Matto Grosso. Let’s imagine this happened some time in 16 century in this newly discovered world. You may think it’s a far-fetched story but bear with me, as this is not about how imaginative we can be, it’s about a point. Moving along with this story, the parents of the boy die when reaching a group of natives deep in these forests. Let’s say they contacted a deadly disease. The boy inherits the belongings of parents: a book only, the Bible. The reason they came there from Europe in the first place, to spread the Good News, to evangelize. The natives take care of the young boy and he grows up reaching maturity. He knew how to read and one day he decides to read the Bible. He remembers vaguely about his parents mission: to give others the Good News. He does not remember anything about the tradition of the Church, about what the Early Fathers have said, no Internet or phone to ask, nothing except this book. Now he begins to read from it, and realizes that he must continue his parents legacy. So now here is my question: Do you think in cases like this is possible to deliver the Good News to others or it’s impossible, in other words should not even attempt. One more scenario: Suppose I would decide to cross the Styx and come into the Catholic faith, what are the beliefs you have as a Catholic, how would you describe to me the Plan that God has with mankind? Or, if it’s easier, assume for a moment I am a native from Matto Grosso which heard from the boy his story as he understood it from Bible, but now he hears a different version. Agape, we do not have to imagine your scenario. It has really happened. Protestants have been shipping Bibles to China for decades in the hopes of spreading the Christian faith. The result is that there are tens of thousands of tiny sects, some cults, in China — with the weirdest assortment of beliefs you can imagine. That is the kind of thing that most likely would happen to your poor natives and the boy. The Bible is essential, but not sufficient on its own. It is most likely impossible to get functioning Christianity of the most simplistic kind from this, but it depends on a few things, like how old the child was and how much instruction he received and if he was baptized and if he understood to baptize those to whom he preached. I don’t ever sell short the Holy Spirit! But looking at China — a scenario similar to what you proposed — one has to be very doubtful. St. Francis Xavier, a Jesuit and the greatest missionary in the history of the Catholic Church, arrived in Japan in l549, intent on converting it. He had some success in his few years there, and other missionaries took up where he left off. They succeeded in establishing a vibrant if small Catholic community. For a time the Japanese rulers showed a certain friendliness towards the missionaries, primarily because the rulers valued trade with European merchants. But in l596 certain political changes caused a backlash against the Christians in which Toyotomi Hideyoshi, the actual ruler of Japan (not the emperor), outlawed Christianity and ordered the arrest of recalcitrant believers. Eventually a total of twenty-six men, nineteen of them Japanese, some priests, others laymen, were arrested and sent on a forced march to the city of Nagasaki. Along the way they were periodically tortured, their treatment designed to intimidate other Christians. Early in l597 the band of martyrs were crucified on a hill near Nagasaki, tied or chained to crosses, then pierced with lances. All of them, including two boys, remained joyfully faithful to the end. One of them, a Jesuit brother named Paul Miki, never ceased to preach fervently to the crowds, even as he hung on the cross. As always with martyrs, this persecution had the opposite affect from what its perpetrators intended. It inspired the remaining Christians and attracted new converts, the site of the execution was venerated as a sacred place, and Nagasaki came to be the chief center Japanese Christianity. For a time the persecution abated, but in the l620’s the government expelled all foreigners from the country except for a small group of Dutch traders. As part of this attempt to expunge all European influence, the practice of Christianity was forbidden, and there were yet more martyrs. More than two centuries passed, and this inspiring story was forgotten in the West except by a few people. But when Japan once again opened itself to Westerners in the l850’s, French priests established a church in Nagasaki. To their amazement, they were visited one day by a Japanese man who was a Christian and who asked the priests three questions: whether they venerated Mary the Mother of God, whether they were married, and whether they followed the pope in Rome. When the answers proved satisfactory, a whole community of “hidden Christians” began with great joy to practice their faith openly. You see it is people — living witnesses — who are needed to keep the faith alive. As for describing the plan of God — that is exactly what the creeds do. If I may intervene. The Catholic Church considers the Scriptures to be the inerrant word of God and the primary source of doctrine to which Tradition and the Magisterium (Teaching authority of the Church) are the guides to properly interpreting sacred doctrine revealed by Christ and the Apostles. The plan of salvation is that God created the world with Adam and Eve, born in a state of grace, and set before them a choice to obey His commandments or not, they freely chose sin and so they suffer death, however they looked forward to a Messiah as promised them by the Lord. They died before seeing Him but died in the expectation and hope of seeing Him and repented of their sins. In the coming centuries [?] God raised up a people under the seed of Abraham, the nation of Israel who were weak but He showed mercy and grace to show His great strength. He granted them His divine commandments which were good but only a shadow of the fulfillment to come in the New Law provided by the Messiah. So came the blessed Virgin Mary conceived immaculate and free of original sin (lack of grace that the human race had forfeited in Adam and Eve) as a grace from Christ so as to be fit to hold Him in her womb. God also sent a Fore-runner, St. John the Baptist to prepare the way for Christ, and so Christ preached the fulfillment of the Law, the life of charity and obedience to God’s commandments in the life of grace. The letter of the former Law distinguished good and evil but did not grant the power to fulfill the letter, that alone was what grace grants. Christ having come as fully man and fully God in one person of two natures united but wholly distinct knew all things from His divinity and as such gave His life (it was not taken from Him) as a loving oblation of love to the Father (and the Holy Spirit and His divinity) for the redemption of mankind. He personally atoned for every sin committed by every man and woman across history and from His stripes all men have had the chance to be healed by grace, some have accepted some have denied it. By this manner Christ died in His humanity (see Acts 3 regarding how the Jews crucified the Author of Life or Acts 20 regarding God purchasing the Church with His own blood) and His human soul descended into Sheol, to minister to the saints of the Old Testament who could not yet enter Heaven because Christ had not yet opened it, and on Easter He arose again. The saints were lifted into Heaven thus and Christ came to the Apostles resurrected in a glorified body (much like that He showed them at the Transfiguration on Mount Tabor). To them He gave them His ministry of running the Church under the influence of the Holy Spirit having reinforced St. Peter as the head of the Apostles prior to His death. From thence they preached the Gospel of salvation through the Christ and His Body the Church, by grace through faith and works, grace immediately accessible as an infused life of the Holy Spirit and action of God through the holy sacraments Christ had instituted and provided for them. Ever since the Church has been protected by the Holy Spirit from teaching error for one is His bride the Church, free of corruption in doctrine, and so it stands as the one true Holy and Apostolic Church, the only normative means of salvation, for under no other name then Christ’s shall a man be saved and it is only in the Catholic Church that Christ is wholly present. God may save those whom He chooses to grant mercy but it is by the Church that He has, insofar as it has been revealed, granted grace to mankind. The Church in some sense might be considered the sacrament of salvation to the world. and of course I forgot, Christ will come again in the fullness of time after He ascended into Heaven after His resurrection (40 days heaven). In the last times He will come to judge the living and the dead, some to whom go to eternal life and some to eternal perdition, some to eternal life because they have affirmed in their hearts their love for God above all things and have made their wills by the effect of grace to forever abide in Him and obey His commandments, while those in eternal perdition have hardened their hearts in eternity towards God and so they live in eternity confounded, punished for their sins which they hold in malicious content in eternity and forever not knowing God because they will in their eternity not to know Him who granted them life. God mercifully grants them the full dignity of a life where their free will has real consequences about how they want to relate to God. In some circles it is said that Hell is the flames of God’s love burning their souls because they cannot adore Him and disdain Him in eternity. Similarly it is known to Catholics that the veneration of holy saints profits a man much (see James 5) as a glorification of God and an asking for God’s assistance through His holy helpers. God has confirmed also that the things which His saints come into contact with can perform miracles (i.e the shadow of St. Peter in Acts and the handkerchiefs and pots and pans that St. Paul touched performing miracles). This is why Catholics keep and maintain relics or icons of these saints or holy ones because God can bestow miracles to those who honor His craftsmanship (the making of a saint is the will of God and the granting of His grace). Thanks for the answers, they were detailed, and did answer some of my questions. Mary, incidentaly I know about the story of the Japanese people, I read it long time ago but I still remember it. I welcome Steven R answer and participation, the more the richer the content. But,…there is always a but isn’t it, I am wondering about people who did not hear about Christ for example those who lived before Him and those who lived after but did not hear of Him, of His message of Salvation and Grace. Or what about the children of those Christian denominations who were raised believing differently, yet they accepted Christ as their Savior. They were baptised, some as adults, lived a life of purity to the extent of their abilities and died in their particular faith/denomination. Would they be saved or would they go to hell, because their parents raised them in a different denomination and they had the information ingrained in them from childhood? And moreover what will be the fate of Hindu people, Budhists, and many other religions? They are the ones comprising the vast majority of this Earth now. I ask these questions because I have a different view and you already know it, or at least parts of it. I am curious of what you think about their ultimate fate. Any just person can go to Heaven, but “there is no salvation outside the Catholic Church.” What this means is, anybody who is saved is saved by a relationship with Jesus Christ, who is “the Way, the Truth, and the Life.” There are people out there – I always think of the Dalai Lama – who have a relationship with Christ, but perhaps they don’t know Him by name. I’ve met people with “Catholic souls,” who think, speak, and act like Catholics but aren’t. God has many, many ways of gathering His children around Him. Having said that – and I may get myself into trouble with this, it’s somewhat controversial – I believe that God wills everyone who is able to join the visible, sacramental Catholic Church, because it is here that we have the most graces, including the Eucharist, to become as holy, happy, and free as we can possibly be. In this way we obtain the greatest happiness for ourselves in Heaven, and that’s what really matters, because Heaven is an eternity of forevers. May God bless you on your journey. I have to say I think much the same. Though the farther you are from the Church it seems the much more difficult it is to accept the grace of Christ fully into your heart unto justification and salvation. Yes, to clarify my remarks, everything hinges on the word “just”. If you think you’re a “good person” but happen to have no use for the Church, even though you know it’s from God – well, you may find out that you are not reckoned “just” at all. In the Mass we pray for all. I don’t worry about great masses of people in history or on the other side of the world, because I figure God knows what He is doing. My “caring” about them is infinitismal compared to His love for them! People who worry a lot over this question, I think are trying ultimately to attempt to question God’s righteousness, or find some loophole out of the obligation to live in the Christian faith. This is an old temptation. Satan got the first humans to question God’s fairness and honesty and it was like he put a bug in the ear of all men to do that. Pope John Paul II said that fallen men have the propensity to question the judgement of God as though their own judgement was somehow better, more righteous. And God’s response to that was to come to earth and place Himself completely at the mercy of human judgement, thereby demonstrating the inadequacy of our judgement! So we have to just trust and not overly concern ourselves with what is in the purview of the Almighty and stuff we can’t usually even do anything about anyway. If we feel called to pray for missions, like St. Theresa, that is great. Or if we are called to go to some far off place and evangelize — that is great too. But most of us will have our hands full right at home! Nulla Salus Extra Ecclesia, right? Taken from Unam Sanctam if I remember correctly? There is no salvation outside the Catholic Church. Pretty bold statement, isn’t it? I am afraid that such an exclusive statement exclude grey areas like salvation of people such as Dalai-Lama, this can open the door to wider implications such as affirming that there are other options besides Scriptural texts such as: Acts 4:12 and also Unam Sanctam. Let’s have a look at the implication of a statement like this. If you are not a Catholic at the time of your death, you will automatically go to hell, where you will spend eternity, tortured by the eternal flames of a fire which will never go out. Jehovah’s Witnesses are among the worst of them as they reject the doctrine of trinity, immortality of soul, and hell. The Adventists also fit somewhere in here, as they re-adopted only the doctrine of trinity. Of course this can open another discussion about predestination mentioned above, etc. but we won’t go there. According to the census, we are now around the 7 billion souls on this planet. The Catholic Church numbers over one billion adherents; all of them will be saved, all of them going to Heaven. We have approx. 6 billion destined eternally to torture in hell. 1)That the sacrifice of our Lord and Redeemer provides a way for all people to be saved: first the Church, the first fruits, the Bride of Christ, the Levites prepared for a task to assist with the second harvest. Their selection and preparation is now during the Gospel time. 2)That the rest of the world will be given the opportunity to be saved during the Millennial Reign of Christ (Head and members). They will be provided with all the information necessary for knowledge and also all the necessary assistance to make progress, to learn and obey God and ultimately to come in harmony with Him as it was intended in the Garden of Eden. Those who still refuse will be punished with the punishment for sin: death. 4)Renounce the teaching of cessation of all senses (death) as a punishment for sin; accept the teaching with hell of torment instead. 5)Renounce the teaching that the soul dies, accept the teaching that the soul is something apart from body, immortal yet desiring a corporeal body. Now, put yourself in my situation for a moment or even longer. Don’t answer fast. 1. Catholics do believe that the sacrifice of Christ provides a way for all to be saved, but we also believe what Jesus said — there is the possibility of some being cast into outer darkness where there is wailing and gnashing of teeth. 2. Knowledge is not what saves That is a Gnostic idea. Love (charity) is what saves. Even obedience to some set of laws does not save, although we show our love for God by obedience. We can only be obedient by grace — not by our own power. 3. We believe in one God. God is not one in the same way God is three. I think you are confused by the word “mystery” — it does not mean, something we don’t know, like a “murder mystery”; the word mystery (a biblical word) means something that can only be revealed by God because it is beyond what we could discover using our reason. It doesn’t mean that it is something unreasonable, merely that it takes more than human reason — i.e. supernatural revelation for us to know it. For example, reason can tell us there is a God and even that God is a personal being. But reason could not reveal to us that God is love. So to, that God is three persons is revealed. 4/5. That the soul is spiritual (and spirit cannot die of be destroyed) is something that can be understood merely through philosophy — human reason — apart from revelation and has been known and understood by almost all people throughout human history. Consider this: What is a thought? Is it something real? When you say you had a thought about something, are talking about something, or about nothing? If a thought is real, what kind of reality is it? Is it physical or spiritual? Physical would mean that you could talk about how big it was or how much it weighs. So a thought is not a physical thing, is it? It is a spiritual thing. What about a desire? When you say you want something is your wanting something? What about a memory? Is a memory spiritual or physical? Now you understand that something spiritual is higher than something physical, right? So how could these spiritual powers of will, intellect, and memory be produced by something merely physical. There has to be something about you that is spiritual. If your finger were cut off, would any less of you be present? Of course not. So you cannot be merely your body. All living things are animated by soul. Soul is the life-force. Even plants have souls because they are alive. But in animals the soul is sensible — it has powers of sense perception. In man the soul is both sensible and spiritual. Man not only can sense things, he can think about what he senses. He can think abstractly — meaning he can comprehend the essence of things. I gave my chickens a leftover chicken nugget and my grandkids said, “Oh, how can they eat that? They are eating another chicken.” I told them, “The chicken doesn’t know it is a chicken. You know it is a chicken and you know you are a human being, but animals don’t know what they are.” Knowing what you are, recognizing the nature of things — that is abstract thinking and is a spiritual power of the human soul. And only something spiritual can possess a spiritual power. so human being are a unity of a spiritual souls and a physical body. Now to the question of what death is. Death is the separation of that life force from the physical body. Since the lives of animals and plants are not spiritual, when their life leaves them, it doesn’t continue apart from their bodies, but human souls are spiritual and spirit cannot die. However a spirit can choose to cut itself off from its source which is God (remember the soul has the power of will so it can make choices). That doesn’t “kill” the spirit, but it creates great anguish in it. It also creates great anguish in the spiritual soul of a human to be separated from the body. That is why we so fear death. And that is why the resurrection of the body — the reuniting of the spiritual soul with the body is such a great hope. Humans have always known that they have spiritual souls and that their souls continue after death in some state. There is no culture that didn’t know this, until the materialistic propaganda of the last century. But the great new thing that Jesus brought us was the hope of the resurrection — the reuniting of that soul and body. It was that faith and hope that made the early Christians willing to face death as martyrs. Agape! I have been following this thread with great interest. What would I do? First, I would compliment you on your courage in staying with this conversation. You are both brave and humble, and I want you to know that I — and I’m sure many others — have noticed. God bless you for this. Second, I would gently suggest that you discover the precise meaning of “Nulla Salus Extra Ecclesia.” This is critical because what you’ve written is most certainly NOT what the Catholic Church teaches as the meaning of that statement. To get the true Catholic understanding of this statement, you must use an authoratative Catholic source, not just what some Catholic on the street (like me?) might tell you. The simplest source is the Catechism of the Catholic Church (CCC). In dealing specifically with “Nulla Salus Extra Ecclesia,” the CCC teaches that anyone who *KNOWS* the Catholic Church is the true church of God and yet decides to turn away from Catholicism, well, they probably have a problem. But the CCC the specifically states, “Those who, through no fault of their own, do not know the Gospel of Christ or his Church, but who nevertheless seek God with a sincere heart, and, moved by grace, try in their actions to do his will as they know it through the dictates of their conscience – those too may achieve eternal salvation” (847). Quite different from what you thought “Nulla …” meant, yes? Again, let me thank you for your courage in continuing this discussion, as well as for letting me join in. No, I should thank you. Re-reading my thread I noticed I don’t like my own tone. I will read the suggested literature. I went to the web-site suggested by Mary I think (St. Boromeo) and it will take me some time to digest all the information there. Right now I read the more relevant (for me) passages. I like the inputs from anyone and everyone willing to join the conversation. We all have various gifts which can contribute in various ways to edify. Agape, your tone was intense, not nasty. No apologies are necessary. You, like all of us here at Catholic Lane, love God with intensity. That will come through in our writings from time to time — on both sides. I hope that this very long thread has shown you that there are sincere Catholics who have researched the Catholic faith and find it to be consistent, logical, and full of love and fun (see picnic references above!). We want so badly for you to see what we’ve discovered. You, in turn, want so badly for us to see what you’ve discovered. Let us celebrate that we all love God! You are right about the “lawyer language.” Official documents will always have official language because common language is too imprecise, and imprecision is dangerous to souls. Hopefully forums like this can help translate official language into more understandable bites. I commend you again for being willing to read the site Mary’s given you. That is where I got my quotes, both direct and paraphrased. It was easier for me that it will be for you as I knew what to look for. The CCC is referenced by its paragraph numbers. Given the discussion we’ve had here at Catholic Lane, you might jump in around paragraph 800 or so to read about salvation. Does anyone else on this thread have a suggestion for Agape on where to begin in the CCC?